The 10 Best Sports Bars in Washington State! There’s nothing quite like the electric energy of a great sports bar, where you and your friends can enjoy some great food, quality beer, and your favorite team up on the big screen. Washington State is no stranger to sports bars, so sit back and enjoy a cold one while we show you our 10 favorites. Quality Athletics in Seattle offers a new take on the traditional sports bar, but is still full of flat screens. Enjoy the great vibes, good service, a supremely high quality menu, outdoor fire pit, and rooftop garden with all your friends here at Quality Athletics in the Pioneer Square District in Seattle! Catch the game here at Rookies Sports Bar in Seattle, and enjoy some top quality pub eats with your friends and family. The fun and welcoming sporty atmosphere, great customer service, and tasty eats have locals (and visitors!) loving this cozy sports bar and grill. The Wave Island Sports Grill and Sushi Bar in Spokane has something for everyone, and for every season! This island-inspired sports bar is an amazing place to watch all your favorite sports teams battle it out while you enjoy award-winning eats like sushi, island eats like chicken katsu, and classic bar eats like burgers and wings. Paddle out and catch the Wave next time you’re in Spokane! 24 Taps in Spokane is a fun and casual sports bar that offers a variety of classic eats alongside some adventurous menu items as well. The name says it all when it comes to the ice-cold beer variety. Enjoy great burgers and hefty sized portions at an affordable price. Locals and travelers alike rave about 24 Taps in Spokane! This sports bar features 24 flat screen TVs, home-styled food, a large beer wine and cocktail selection, gigantic portions and great prices! This well-loved neighborhood sports bar gives locals and visitors a fun and cool vibe that will keep you coming back for every game. The Loose Wheel also has pool, darts, air hockey, foosball, and basketball in the court. The George and Dragon Pub in Seattle has been a cool British pub serving the area since 1995. Enjoy authentic English breakfast eats, an awesome beer and cocktail list, and of course, soccer games on the telly! 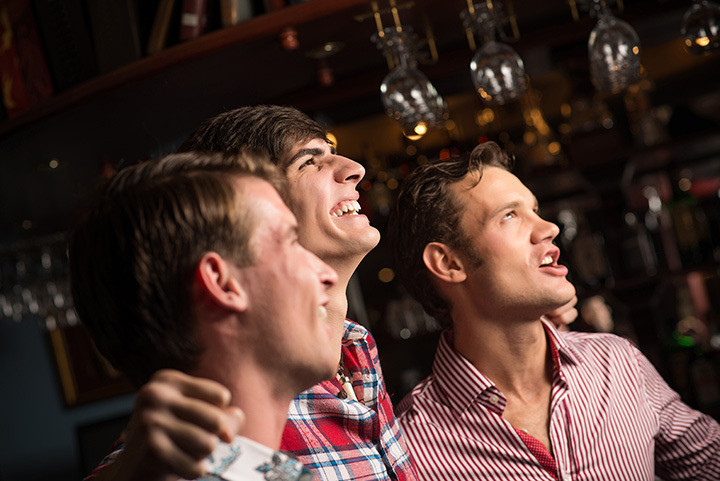 Stir up the crowd with your friends here at the George and Dragon Pub. Buckley’s in Belltown is an awesome neighborhood sports bar located in a beautiful turn of the century building. They have all the sports bar basics such as a ton of flat screens, great food, and good beer, but customers also get to enjoy top notch service and an atmosphere that makes a friend out of anyone. Make Buckley’s in Belltown your next go to spot for the big game! Boston’s Restaurant and Sports Bar in Spokane offers a relaxed space and an inviting atmosphere to enjoy the big game with all your friends. Enjoy great pizza, burgers, and wings and more here at Boston’s Restaurant and Sports Bar! For solid food, great beer and service, and a great place for watching all of your favorite sporting events, look no further than the Main Event Sports Grill in Vancouver, Washington. Make sure to try some of their interesting and fun fare like the peanut butter burger! The Cloverleaf Sports Bar and Grill has been serving Bremerton since 1973. This neighborhood favorite is serving up high-quality eats and provides an ideal atmosphere for catching the big game.